The Victoria Golf Course and Driving Range is Canada’s oldest city-run golf course and continues to be one of the busiest municipal golf courses in the world. Rehabilitation work on the golf course is needed to extend the course lifecycle and improve the overall guest experience. A two-phased approach to this project will occur in 2018/2019. Work on Phase II is anticipated to begin in the spring of 2019 (end of April/early May). The course will remain open for play throughout construction. Phase I rehabilitation work as completed at the end of 2018. 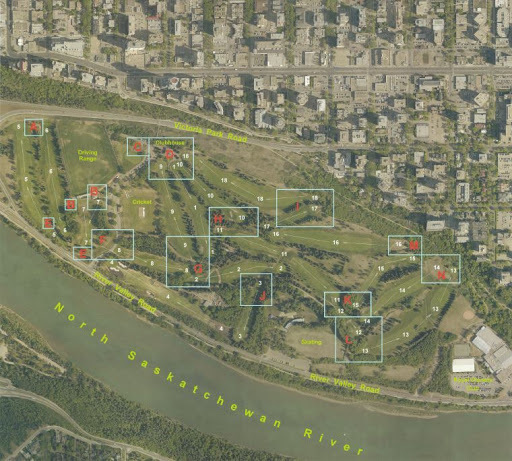 In Phase I, rehabilitation work at Victoria Golf Course will focus on removal of timbers on and around the tee boxes at holes 3, 7, 8, 13, 16 and 18. In Phase II, rehabilitation work will focus on improving golf course traffic circulation by upgrading the cart paths. Multiple high-traffic paths will be converted to asphalt and designed for better access and circulation. This phase will involve some changes to course design to improve drainage and durability, including removal of the sand trap at hole 18 and redesign of the tee boxes at holes 3, 12, 14, 16, and 18. In Phase III, minor clubhouse renovations will improve public access to the second floor with the addition of an elevator to the main lobby. This phase is currently under design.